Compared to other animals, Dolphins are believed to be very intelligent and friendly animal. Dolphins have saved drowning people by pulling them to the shores. Dolphins live in families. These dolphin families are usually lead by the female dolphin. Dolphins in the family help each other like raising young dolphins when big ones go in search of food. Male dolphins are called "Bulls". Female dolphins are called as "Cows" and the young ones called as "Calves". Group of dolphins are called "school of dolphins"
The big killer Whale is also a type of dolphin. 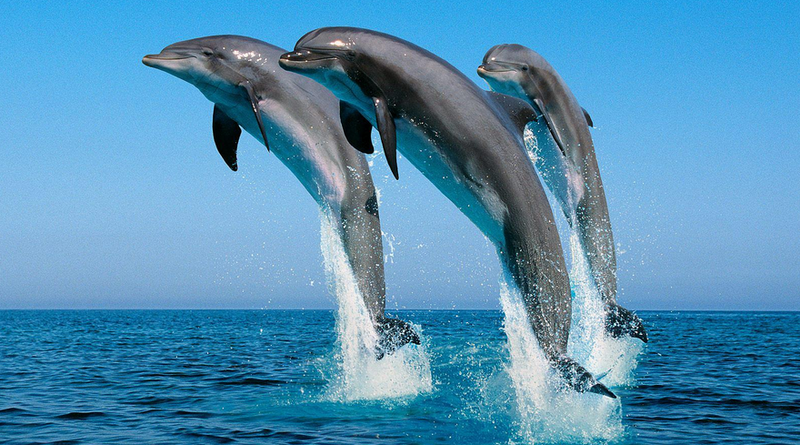 Bottlenose dolphins are the most common and well known type of dolphins. Dolphins have to come to the surface to breath. They breath through blowhole on the top of their head. Several million years ago, the ancestors of dolphins actually lived in land near water. These animals had appearance like wolves and used to go to shallow water to hunt small fishes. Slowly they adapted to live in water. Dolphins are in danger. Few types of dolphins have already extinct. The pollution in sea water, hunting by humans are the main reason for their extinction.